"Samizdat: The Czech Art of Resistance, 1968 to 1989"
Creating and disseminating ideas or art—even if non-political—that did not conform to official ideology was considered to be an act against the state. This could, and did, lead to imprisonment for many of those found to be participating in this “unofficial culture.” Samizdat explores how these seemingly small acts of opposition played a crucial role in resisting the totalitarian regime in Czechoslovakia, which was eventually displaced by the leaders of underground culture—including such producers of samizdat as writer and first president of Czechoslovakia, Václav Havel. The exhibition also explores other forms of cultural resistance and includes examples of artist projects, music and video documents of undergound events. 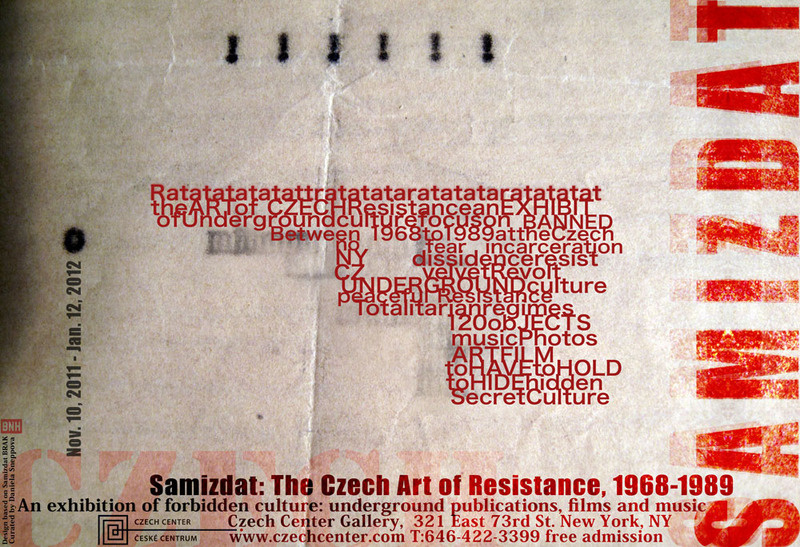 Samizdat: The Czech Art of Resistance was organized by Czech Center NY and curated by Daniela Sneppova. 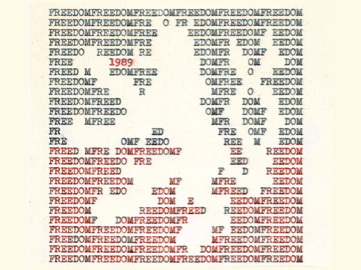 It is part of Roads to Freedom: Czech Alternative Culture before 1989, a series of events celebrating the Czech holiday Struggle for Freedom and Democracy Day (Den boje za svobodu a demokracii). Roads to Freedom also includes a two-day symposium on samizdat presented in conjunction with New York University Prague; a concert by seminal Czech underground band Garage (Garáž); a Velvet Revolution party; and screenings of two underground films (see below for further information). Symposium organized by Czech Center NY in collaboration with New York University Prague. Samizdat events are organized under the auspices of Václav Havel. Czech underground band Garage (Garáž) plays. Organized by the Czech and Slovak Consulates General, Czech Center NY, and +421 Foundation. An historical exhibition of underground publications from Czechoslovakia from this period. A senior Communist official and his wife discover that their house is riddled with listening devices planted by his own ministry. An odd assortment of bourgeoisie and female prisoners are “re-educated” by working in a junkyard in this comedy set in the late 1940s. "Samizdats" were objects to have and to hold and to hide. "Samizdats" were small acts of resistance that challenged the Soviet regime. "Samizdats" were works of art that circulated secretly and inspired thousands. "Samizdats" were dangerous: produced, distributed and consumed at great personal risk.